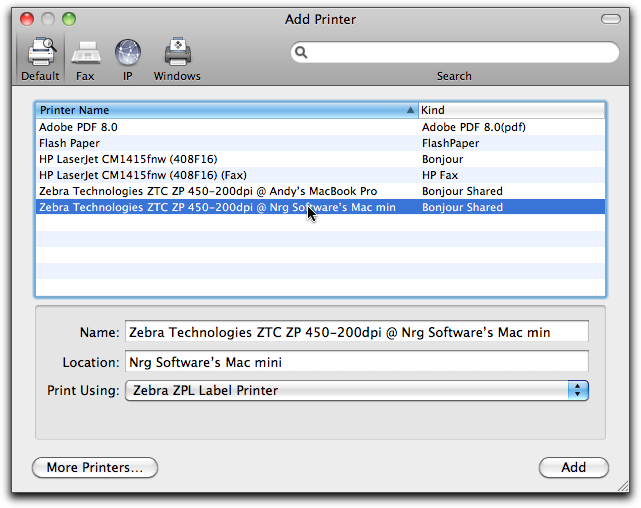 NRG: Mac & FileMaker Shipping Software :: Can I print labels to a networked or shared Zebra Printer with NRGship for UPS? Can I print labels to a networked or shared Zebra Printer with NRGship for UPS? Yes, you can print your UPS labels to a shared Zebra printer with NRGship UPS. Just make sure the Mac that the printer is connected to (or Airport Express) is always on to maintain your connection. 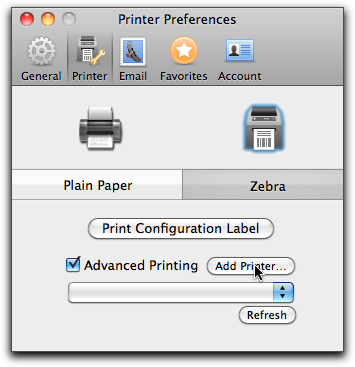 In Preferences, check the box for Advanced Printing and then select Add Printer. Use the Mac OS X Printer and Fax control panel like you would normally. When adding your printer, make sure to select Zebra ZPL for Print Using. (Note: Zebra Printers without a USB port are not supported) Once you have added the printer, go back into the NRG preferences and hit refresh. Select your printer from the list and start printing.